Ships tomorrow if you order in the next 23 hours 60 minutes. No, it's not reading, writing and arithmetic. And it's not reuse, reduce recycle either. The 3 Rs we're talking about are found in a rejuvenating Rhodiola Pro Blend - Rhodiola Rosea, Eleuthero and Maca. Together they can promote oxygen utilization, mental sharpness, physical endurance and improved fat metabolism. 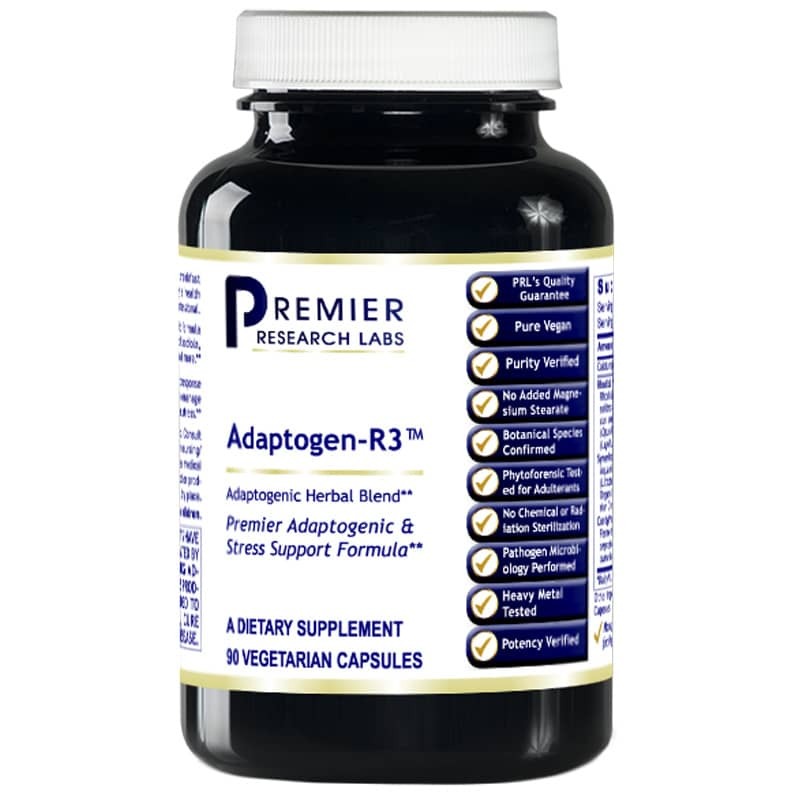 Adaptogen R-3 from Premier Research Labs has a world-class formula designed to support lean-body boost, your immune system and healthy rejuvenation. It is believed that adaptogens, like those found in this product, can decrease your body's sensitivity to stressors. The synergy of the adaptogenic herbs formulated for Adaptogen R3 may help you achieve a healthy weight, get back the energy you need, and promote overall wellness. Other Ingredients: vegetable cellulose capsule. Pure Vegan. Adults: Take 3 capsules at breakfast or before 2 P.M. or as recommended by a healthcare professional. My natural dr recommended Adaptogen R3 with Adrenaven.. Not an over night fix. No side effects for me. Little irritations I was having have diminished. My doctor recommended Adaptogen and I think they are helping. Natural Healthy Concepts has the best price on the internet. Does increase energy, but I think the Fo Ti caused frequent BM's. Also afraid of things I read about Do To and liver problems. Not sure how true or accurate that info was. Adapotogen R3 is recommended by my natural doctor. I take along with AdrenaVen. I stared taking Adaptogen R3 over a year ago. I can tell the day after I run out. But I'll continue to take them for now. It helps a lot with menopause symptoms and also gives more energy.